NEW Platinum Quality Material! Platinum Shield Motorcycle Covers provide top level protection against all the elements including rain, snow, wind, UV / Sun rays, and more. Extremely durable exterior with soft fleece lining on interior. The Platinum Shield cover is the best solution for maximum weather protection. Lightweight yet durable, the Platinum Shield offers our highest level protection from all elements. The breathable characteristic of this material naturally prevents mold, mildew, and rust. This cover is made of a high quality woven polyester fabric with a reflective urethane coating that provides excellent water and sun resistance. With an ultra soft fleece liner, your motorcycle's finish will be perfectly preserved and protected. UV-reflective-silver material protects your vehicle from sun damage and keeps your motorcycle cooler. Protects your motorcycle's sensitive clear coat finish from the damaging effects of acid rain. This multi-layered motorcycle cover guards your motorcycle from tree sap, dust, dirt, and other harmful pollutants. Our car covers will accommodate your mirrors without pocketing them. We've engineered them out of the design because mirror pockets are unnecessary and are usually the first part of a motorcycle cover to deteriorate or rip. This ensures that you will get maximum durability from your motorcycle cover! Yes! This cover is sized for your motorcycle by the dimensions: length, width, and height (called semi-custom). Combine the perfect size with the elastic front and rear hems and you are getting a cover that is going to fit your vehicle extremely well. We're so confident that you'll love how our cover fits your vehicle that we will pay return shipping if you receive an incorrect cover! If you require a 100% made to order cover, we can do those as well but they are more expensive. Please give us a call if you would like more information. Quality of fabric is more important than quantity of layers. The Platinum Shield, our most durable cover, is not built upon a layering principle. It is a high quality woven polyester fabric with a reflective urethane coating. Lined with an ultra soft fleece material, your motorcycle's finish will be perfectly preserved and protected. I have modifications and attachments on my motorcycle, what cover should I order? Our checkout page has a comment section. Simply order the cover for your motorcycle and make as many detailed notes as possible about your motorcycles modification. For example if you have saddle bags just state you have saddle bags. This will allow our warehouse team to grab the correct cover. The Platinum Shield cover comes with a FREE storage bag AND an antenna patch. How Does This Platinum Shield Motorcycle Cover Compare with Our Other Covers? Keep your car looking its best. This kit includes a 100% microfiber car duster (25" long), and high quality 36 microfiber cloths! Cable and lock set to lock cover onto vehicle. Great anti-theft device for your cover. For high winds, look at our Gust Strap Wind Protector product. Keep your car clean with the Microfiber car duster. This kit includes a 100% microfiber car duster (25" long). Colors may vary. NEW Satin Quality Material! Satin Shield Motorcycle Covers provide top level INDOOR protection. Our softest, most luxurious material made for your garage kept vehicle. A satin-like stretchy material that is soft both inside and out. This cover is sure to please as it comes with our highest customer satisfaction rating of all covers! INDOOR ONLY: NEW Satin Stretch Quality Material! For the best fit and the softest protection for your bike, our Satin Shield is the best choice for supreme indoor protection! The material is an ultra soft satin stretch fabric that hugs the body of your bike perfectly. This unique stretch-to-fit material creates a sleek and desireable look. It also features our softest liner, providing the maximum protection for your vehicle! The breathable characteristic of this material naturally prevents mold, mildew, and rust. Keep your bike safely stored and looking its very best with this elegant, high quality Satin Shield cover! Indoor Only black satin cover. The ultra soft satin stretch cover material provides our best cover fit. Provides excellent indoor dust protection. The ultra soft liner protects your vehicle's sensitive clear coat finish. How Many Layers Is The Satin Shield Cover? Quality of fabric is more important than quantity of layers. The Satin Shield, our best indoor cover, is not built upon a layering principle. It is a high quality satin stretch fabric. Lined with an ultra soft material, your motorcycle's finish will be perfectly preserved and protected. The Satin Shield cover comes with a FREE storage bag AND an antenna patch. How Does This Satin Shield Motorcycle Cover Compare with Our Other Covers? Ultimate Shield Car Covers provide complete protection against all the elements including rain, snow, wind, UV / Sun rays, and more. This fleece-lined cover is our top rated. 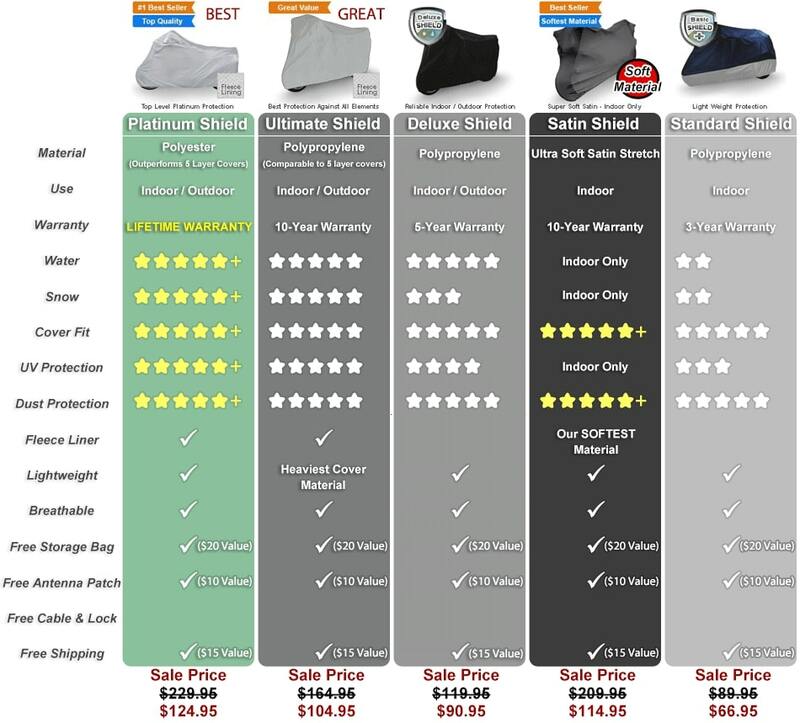 The Ultimate Shield cover provides all season indoor and outdoor protection for your motorcycle. This nearly impenetrable multi-layer fabric is fleece lined to protect fine motorcycle finishes and to ensure your motorcycle's surface stays in pristine condition. The Ultimate Shield has a special multi-layer polypropylene, which is an oil based material, with a layer of micro-porous film sandwiched between it to ensure breathability. On the inside of the cover, there is a soft layer of fleece. Guards your motorcycle from tree sap, dust, dirt, and other harmful pollutants. Our car covers will accommodate your mirrors without pocketing them. We've engineered them out of the design because mirror pockets are unnecessary and are usually the first part of a motorcycle cover to deteriorate or rip. This ensures that you will get maximum durability from your cover! The cover does not come with holes in it for your antenna by default because most customers prefer to not have any holes. If your antenna cannot be removed or retracted when using the cover, we include a free antenna patch kit with each cover that will create a reinforced hole where the antenna can easily slip through. Will this fit my motorcycle? Yes! This cover is sized for your motorcycle by the dimensions: length, width, and height (called semi-custom). Combine the perfect size with the elastic front and rear hems and you are getting a cover that is going to fit your motorcycle extremely well. We're so confident that you'll love how our cover fits your motorcycle that we will pay return shipping if you receive an incorrect cover! If you require a 100% made to order cover, we can do those as well but they are more expensive. Please give us a call if you would like more information. Our checkout page has a comment section. Simply order the cover for your motorcycle and make as many detailed notes as possible about your modification. For example if you have saddle bags just state you have saddle bags. This will allow our warehouse team to grab the correct cover. The Ultimate Shield cover comes with a FREE storage bag AND an antenna patch. How Does This Ultimate Shield Motorcycle Cover Compare with Our Other Covers? Deluxe Shield Motorcycle Covers are great outdoor and indoor covers. They offer amazing protection against rain, sun, dirt and other elements. The Deluxe Shield cover is made from a UV treated PolyShield material with a soft, scratch resistant liner. Designed to provide effective weather protection at a fantastic value. Built-in air vents serve a dual purpose: increased air flow and protection from trapped moisture. This cover also features a built-in heat shield for protection from tailpipe heat. Provides superior protection from harsh elements like rain, snow, tree sap, bird droppings, and more. Breathable fabric with dual built-in air vents. Chemically treated to resist UV rays. Naturally mold and mildew resistant. Fully elasticized hems to help ensure a snug fit. Our motorcycle covers will accommodate your mirrors without pocketing them. We've engineered them out of the design because mirror pockets are unnecessary and are usually the first part of a motorcycle cover to deteriorate or rip. This ensures that you will get maximum durability from your motorcycle cover! Yes! This cover is sized for your motorcycle. Combine the perfect size with the elastic front and rear hems and you are getting a cover that is going to fit your motorcycle extremely well. Our checkout page has a comment section. Simply order the cover for your motorcycle and make as many detailed notes as possible about your modification. This will allow our warehouse team to grab the correct cover. There are double stitched seams and the hem is elasticized in the front and rear of the cover to ensure an extra snug fit. This cover comes with a FREE storage bag and an INCREDIBLE 5 YEAR LIMITED WARRANTY! How Does This Deluxe Shield Motorcycle Cover Compare with Our Other Covers? Standard Shield Motorcycle Covers are great for indoor and light outdoor use. They provide needed protection against dirt and dust! This is for basic protection at a great price. The Standard Shield cover is made from a metalized nylon material and has a tailpipe heat shield for maximum protection. Ideal for indoor storage as a dust cover. How Does This Standard Shield Motorcycle Cover Compare with Our Other Covers?